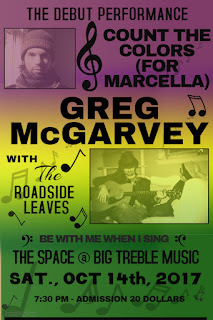 I am happy to announce the Debut Performance of 'Count The Colors (For Marcella),' the album I've written about my late, lovely girlfriend Marcella, on Saturday, October 14 at Morrisville's The Space at Big Treble Music, a new listening room in Bucks County. To help me present the songs, I am putting together an ensemble called The Roadside Leaves to accompany me on-stage. During the time of Marcella's illness (terminal cancer brought on by a genetic disorder called Fanconi anemia), I expressed myself through prose writing, telling the story of our changing relationship in real-time. The moments of darkness, but also moments of humor and love that transcended the sad scenes we were living through. This writing helped me to maintain my sanity and even a sense of purpose while I watched my beautiful girlfriend slip away. One day, she let me know that she was worried about what would happen to me after she passed on. I told her, "I always find a way to maintain." Artistic expression, like in so many other times of my life, proved to be one of the ways that I did this. As it turned out, these prose pieces I posted to the Internet ended up being cathartic to many people, friends and strangers alike, as they dealt with their own personal crises. The hundreds of messages of support I received during this time showed me that I was on the right track to filter these events through my creative prism. The day before she passed away, my friends Righteous Jolly and Nick Crocker came to her hospice room in Philadelphia and they each performed a bedside concert with me. When I spoke to her sister the next day, I learned that she was playing recordings of these performances at the time that Marcella left us. The following week, I was asked by her family to perform music at her funeral. All of these moments of performance were very healing for me, not just because I love making music but because Marcella herself was a deeply impassioned advocate of my music-making. As her first posthumous birthday approached, I decided I wanted to create an art show around the most evocative photographs I took of her. "A Few Moments With Marcella" opened in August 2015, accompanied by lengthy articles in local newspapers. It was an experience that I found beautiful and cathartic. It was my first chance to look back at our time and tell some of our stories while the details were still fresh in my mind. The next month, I took a trip to Nashville with my dad and I found myself writing a new song. I'd focused on photography and prose writing over the previous three years, but it seemed that it was finally time to start telling some of my stories in song. It'd seemed almost like too tall an order. Where would I even start? How could I do justice to this beautiful woman who loved me so much and is still loved by so many? Having heard a few of my songs on our first date, she continually asked me to write a song about her. And I continually left her hanging! What a jerk! Now that Nashville had gotten my creative juices flowing, I pledged to write a whole album for her and to place a copy of it in her old bedroom. "The Grandmas Of Nashville" is dedicated to my nephew Nolan, born just a week after Marcella's passage. A whimsical travelogue, it features references to both Marcella and my dad. The day I wrote it, I ran over to Third Man Records and recorded an extremely rough version of it in the record booth. In the song "Hey Marcella," I tell stories from our early days while the scents of her mother's delicious Italian cooking waft by. "hey, Marcella / you're hard to find these days / but Marcella / you're coming with me, anyway"
"Yer Shoes" recalls the dream vacation Marcella arranged for us just weeks before her diagnosis of terminal cancer. A dual-citizen of Italy and U.S.A., she was a born traveler and loved the freedom of being on the road with people that she loved. "I think I'll take a walk / and breathe some southern air / in between the moments / will you meet me there?" "No Grays And Blues" is a ballad that I wrote using only messages that she left behind in letters, text messages, and graffiti. "I'm broken-down but I'm happy here / I feel lucky to have you near / you know I could hear you sing / and I wouldn't trade you for anything"
“Specks Of Paint On Your Fingernails” is a piano instrumental that I wrote in the music room of her father’s Bucks County home. "Layers Of Winter Clothes" recalls a series of emotionally impactful dreams - one from Marcella's cousin Tommy, and two of my own. "I sang about the lineman / as we began to grieve / we grieved for what was coming / and didn't hide our tears / I woke and I was crying / like I never had before / still I felt so grateful / that she visited once more"
"Count The Colors" begins at the sad scene of her hospice room but ends with my pledge to remember the beauty of her free, artistic, loving spirit more than her dark final days. "when the roadside leaves / tumble down / and gracefully / touch the ground / I'll count the colors for you / I'll count the colors for me"
In "Something So Beautiful," I take words she spoke to me and turn them back on her: "how could you make something so beautiful in a place like this?" I celebrate our shared love of travel and pledge to take her memory with me as I continue on my own journeys. "Centralia was a ways away / where the fire burned underground / you and me made ourselves at home / in other people's towns / we didn't wait 'til the sun came out / we'd just turn the key and drive / you never knew where the time would go / so it was time to be alive"
"Knit Hat Girl," her favorite song of mine, will appear for the first time on this release. She heard it on our first date and instantly loved it. These days, she's in the song, too. About two years after writing “The Grandmas Of Nashville,” I wrote the album’s closer, “Here In The Future,” a piece that gave me opportunity to imagine catching up with Marcella, three years later. I reflect on advice she gave me, the highs and lows of my contemporary life, and tell her about some of the little kids she just missed her chance to meet. Interspersed around the album are clips of Marcella - laughing, singing, and even a recording of her explaining the meaning of her name.